A sense of disbelief and shock prevails in the families of the two immigrants who have been sentenced to death, along with 15 other Indians, by a Sharia court at Sharjah in the United Arab Emirates (UAE) on March 29. A liquor vend falling under the green belt at Bhai Randhir Singh Nagar was demolished today. Area residents were against the vend , as it was near their area and they had already written a letter to the Municipal Corporation authorities to stop opening of the vend from this financial year. Over 40 students of BA I of Gujranwala Guru Nanak College protested outside the Ludhiana Deputy Commissioner's office here today against the non-issuance of their roll numbers by the college for their university exams. It seems the Punjab Forest Corporation's decision of auctioning standing trees to private contractors has resulted in the illegal chopping of trees that were not auctioned. Taking into account a Supreme Court ruling of 1996, Indian Forest Act 1927, Forest Conservation Act 1980, the District Forest Officer has registered cases against Gursharan Singh, Jagdeep Singh, Piara Singh, Hargurjit Singh under Sections 29, 30, 31, 32 and 33 of the Indian Forest Act 1927. Inability of the drug control authority to regulate buying and selling of scheduled "H" drugs has given drug addiction an ugly turn as was evident from last night's incident, wherein, a group of drug addicts staged dharna outside a chemist shop, alleging that the chemist was selling habit-forming drugs to students. A day-long sensitisation workshop on HIV/AIDS was organised today by the Department of Microbiology, DMCH, and Integrated Counselling and Testing Centre (ICTC) on HIV/AIDS. Students of Spring Dale Senior Secondary Public School have shown outstanding performance in the international science olympiad.Navninder Gill of Class XI-B stood first. He has been selected for the second level examination to be held in New Delhi in April. Mirza Ghalib was not a popular poet in his lifetime. Ibrahim Zauq, the mentor of the emperor Bahadur Shah Zafar, had dwarfed him in the royal court and Momin Khan Momin was his rival in the field of Urdu poetry. Now Zauq and Momin are seldom talked about, whereas, Mirza Ghalib’s popularity is on the surge. His relevance in the modern times has never been in doubt. In a bizarre incident, the local Krishan Gopal Gaushala (Cow Shelter Home) was yesterday found burying dead cows in the dunghill in the back yard of the gaushala near the railways lines. Shell out Rs 10 to deposit money in banks! Customers, who came to deposit money, were in for a shock after public sector banks here charged them Rs 10 per packet (a packet contains 100 notes). The BSNL Casual and Contract Workers Union, Ludhiana, held its general body meeting here today. 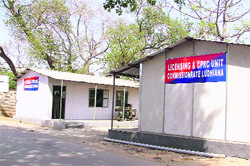 As many as 21 weapon licence forms were sold by the police on the first day.Following the commissionerate system, the Commissioner took charge of issuance of arms licenses.A communiqué issued by the Commissioner's office stated that the applicant seeking weapon licence could visit the licensing unit on any working day between 9.30 am and 12.30 am. 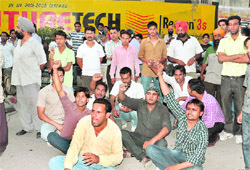 The clerical staff of Excise and Taxation Department today protested outside the DETC office. The Shiromani Khalsa Panchayat and several other panthic organisations today charged the SAD-BJP government in Punjab with pursuing dual policies, especially those, which are not pro-Sikh. The city celebrated All Fools’ Day today. Playing practical pranks, sending someone on fool’s errands, making hoax calls and forwarding fictitious SMSes marked the humour, laughter and enjoyment-filled day. Praveen Bansal, the BJP councillor from ward No 41 in the city, and who is also the Senior Deputy Mayor of Ludhiana municipal corporation, has been nominated assessor of the land acquisition tribunal for Ludhiana Improvement Trust by the Governor of Punjab. A tragedy was averted due to the alertness of the driver of a private bus carrying passengers from this town to Ludhiana this morning.Had the bus collided with a tempo coming from the opposite side, over 60 passengers travelling in two vehicles could have sustained injuries. The Public Information Officials (PIO) from the government departments today attended a seminar on the technicalities of the RTI Act organised by the Regional centre of Mahatama Gandhi State Institute of Public Administration. Sun has barely begun to make its presence felt and all the fashion conscious people of the city are seen flaunting their big-sized, retro style sunglasses with much ado. Members of the PAU Kisan Club held a meeting today, in which they deliberated upon the prospects of Kharif crops and highlighted the superiority of PAU 201 variety of rice in terms of better productivity, early maturity and less water requirement in addition to better quality. After conducting trials twice to select players for the upcoming first World Kabaddi Cup slated to be held at different venues across the state from April 3 to 12, the Punjab Kabaddi Association finally announced the Indian contingent today. 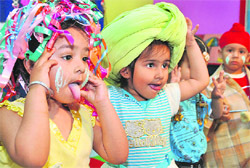 The two-day annual sports meet 2010 of the RIMT Group of Institutes concluded here today. Harvest Tennis Academy trainees Rimpledeep Kaur, Rishab Dev, Jaspreet Kaur and Vishwesh Sinha stormed into the final of the girls’ and boys’ singles (U-16 and U-18) during the HTA-AITA Championship Series 2010 being played at Harvest Tennis Academy. Trials to select probables for the Punjab State Inter District Cricket Tournament will be conducted at MGM Public School, opposite LIC Building, Phase I, Dugri, on April 4 at 9 am.